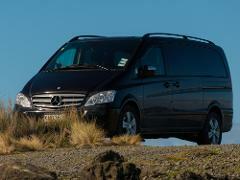 Private hire of a black Mercedes-Benz Viano, with privacy glass and limo-style seating. Suitable for 1-5 passengers. Private hire of a black Mercedes-Benz Viano, with privacy glass and limo-style seating. Suitable for 1-5 passengers. This service is for a minimum of 2 days. VIP Private Charter of a black Mercedes-Benz Viano, with privacy glass and limo-style seating. Suitable for 1-5 passengers. This service is for a minimum of 2 days.